As Jesus Christ traveled through Galilee, He performed many miracles. He also called the Twelve Apostles, empowered and instructed them, and sent them out to minister to the people. If you knew that the Savior were coming to visit your city or town today, whom would you bring to Him to be healed? Why? Matthew, Mark, Luke, and John each recorded events and details of the Savior’s life that are unique to their account. However, the Gospels of Matthew, Mark, and Luke also share much of the same content. Notes to the teacher are given at various locations in the manual to help you know where certain events will be taught in greater detail. For example, the miracles recorded in Matthew 8 and 9 will be addressed in greater depth in the lessons for Mark 1–5. Invite a student to read Matthew 8:16–17 aloud. Ask the class to follow along, looking for a prophecy Jesus Christ fulfilled as He performed these miracles. Invite students to report what they find. What makes these individuals unique among all the people on the earth today? Invite students to look for truths as they study Matthew 9–10 about the role of Apostles and the blessings they can bring into our lives. Invite a student to read Matthew 9:35 aloud. Ask the class to follow along and look for what Jesus did in addition to healing others. In addition to healing others, what did Jesus do during His ministry? Explain that as Jesus preached the gospel and performed miracles throughout Judea, the number of people who followed and sought after Him increased. Invite a student to read Matthew 9:36–38 aloud. Ask the class to follow along, looking for whom the Savior said He needed to help Him minister to all those who followed Him. According to verses 37–38, whom did Jesus say He needed to help Him take care of those who followed Him? Invite a student to read Matthew 10:1–4 aloud. Ask the class to follow along, looking for what Jesus did to help meet the people’s needs. What did Jesus do to help the multitudes of people who followed Him? Invite a student to read Matthew 10:5–8 aloud. Ask the class to follow along, looking for what Jesus Christ commanded His Apostles to do. What did Jesus command His Apostles to do? Explain that the word apostle comes from a Greek word that means “one sent forth.” At first the Apostles were sent only among the house of Israel. Later, the resurrected Savior commanded that the gospel also be preached among the Gentiles, or those who are not of the house of Israel. What similarities did you notice between the works Jesus did and the works He commanded His Apostles to do? Refer again to the pictures of the current Apostles. Ask students to give examples of how the current Apostles preach and minister as Jesus Christ would if He were here. After students identify and understand gospel principles and doctrines as found in the scriptures, they may not apply them until they feel their truth and importance through the Spirit and sense some degree of urgency to incorporate the principles in their own lives. One of the most effective ways to help students do this is to encourage them to reflect on and share personal experiences related to those truths. How can understanding that Apostles are called by Jesus Christ to do His work influence how we respond to what they teach and counsel us to do? In what ways have the ministries and messages of modern Apostles influenced your life? Invite students to faithfully seek opportunities to listen to, study, and apply the words of the Lord’s chosen Apostles. Summarize Matthew 10:9–16 by explaining that the Lord instructed the Apostles to trust in Heavenly Father to provide for their needs as they traveled to preach the gospel. The Savior also taught them to bless the people who received and housed them. Ask students to think of a time when someone not of their faith asked them a difficult question about the gospel or asked them about something controversial regarding the Church. How confident were you in knowing what you should say in that situation? Why? Invite students to look for a principle in Jesus’s teachings to His Apostles in the remainder of Matthew 10 that can help us when we need to explain the gospel or share our testimony. Invite a few students to take turns reading aloud from Matthew 10:16–20. Ask the class to follow along, looking for the kinds of challenges Jesus said the Apostles would face as they traveled and preached. What challenges did Jesus say His Apostles would face as they went forth to preach the gospel? Summarize Matthew 10:21–42 by explaining that Jesus Christ continued to give His Apostles instructions, warnings, and comfort about the challenges they would face. 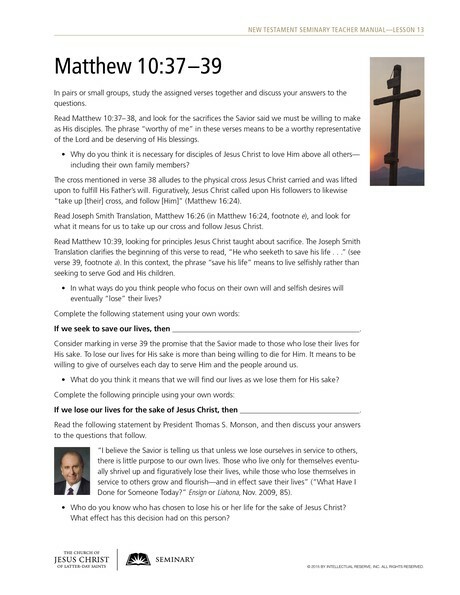 To help students study the Savior’s words in Matthew 10:37–39, divide them into pairs or small groups and give each pair or group a copy of the accompanying handout. Invite students to follow the instructions on the handout by studying the assigned verses together and discussing their answers to the questions. In pairs or small groups, study the assigned verses together and discuss your answers to the questions. Read Matthew 10:37–38, looking for the sacrifices the Savior said we must be willing to make as His disciples. The phrase “worthy of me” in these verses means to be a worthy representative of the Lord and be deserving of His blessings. Why do you think it is necessary for disciples of Jesus Christ to love Him above all others—including their own family members? 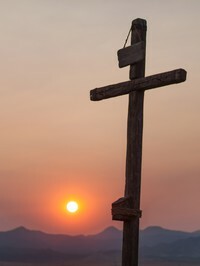 The cross mentioned in verse 38 alludes to the physical cross Jesus Christ carried and was lifted upon to fulfill His Father’s will. Figuratively, Jesus Christ called upon His followers to likewise “take up [their] cross, and follow [Him]” (Matthew 16:24). Read Joseph Smith Translation, Matthew 16:26 (in Matthew 16:24, footnote e), and look for what it means for us to take up our cross and follow Jesus Christ. Read Matthew 10:39, looking for principles Jesus Christ taught about sacrifice. The Joseph Smith Translation clarifies the beginning of this verse to read, “He who seeketh to save his life …” (see verse 39, footnote a). In this context, the phrase “save his life” means to live selfishly rather than seeking to serve God and His children. In what ways do you think people who focus on their own will and selfish desires will eventually “lose” their lives? If we seek to save our lives, then . Consider marking in verse 39 the promise that the Savior made to those who lose their lives for His sake. To lose our lives for His sake is more than being willing to die for Him. It means to be willing to give of ourselves each day to serve Him and the people around us. What do you think it means that we will find our lives as we lose them for His sake? If we lose our lives for the sake of Jesus Christ, then . Read the following statement by President Thomas S. Monson and then discuss your answers to the questions that follow. “I believe the Savior is telling us that unless we lose ourselves in service to others, there is little purpose to our own lives. Those who live only for themselves eventually shrivel up and figuratively lose their lives, while those who lose themselves in service to others grow and flourish—and in effect save their lives” (“What Have I Done for Someone Today?” Ensign or Liahona, Nov. 2009, 85). Who do you know who has chosen to lose his or her life for the sake of Jesus Christ? What effect has this decision had on this person? After students have completed the handout, you might ask a few to summarize for the class what they have learned. You may want to share your testimony of the principle students identified concerning losing our lives for the sake of Jesus Christ. Invite students to list in their class notebooks or scripture study journals some things they can do today or in the near future to lose their lives in the service of Jesus Christ and others. Invite them to set a goal and act upon that goal. “One of the most difficult tests of all is when you have to choose between pleasing God or pleasing someone you love or respect—particularly a family member. “Nephi faced that test and handled it well when his good father temporarily murmured against the Lord (see 1 Nephi 16:18–25). Job maintained his integrity with the Lord even though his wife told him to curse God and die (see Job 2:9–10). “The scripture says, ‘Honour thy father and thy mother’ (Exodus 20:12; see also Mosiah 13:20). Sometimes one must choose to honor a Heavenly Father over a mortal father” (“The Great Commandment—Love the Lord,” Ensign, May 1988, 5). After summarizing Matthew 10:21–42, invite a student to read Matthew 10:34–35 aloud. Ask the class to follow along, looking for what Jesus Christ said would happen as His gospel was preached. Explain to students that Jesus Christ was not saying that the purpose for His coming was to divide families and bring conflict to the earth, but rather He was teaching that the manner in which individuals respond to Him and His gospel can cause divisions and discord. Those who choose to follow Christ may experience tension with and even animosity from those who do not receive Him and His gospel, including family members and friends. This was a warning to His disciples not to expect their lives to be without trial or opposition. How can the gospel of Jesus Christ bring peace to an individual who accepts it and lives it? In what ways could that same individual experience conflict, opposition, or discord because of his or her acceptance of the gospel? In what ways did Jesus Christ’s coming divide the people living on the earth during His mortal life? Invite a student to read Matthew 10:36 aloud. Ask the class to follow along and look for what the Savior identified as the source of some of the opposition His disciples would experience because of their acceptance of the gospel. Invite students to raise their hands if they have experienced, or know of someone who has experienced, opposition or persecution from a family member for believing in the restored gospel of Jesus Christ. What other difficult choices might disciples or followers of Jesus Christ face because of their acceptance of the gospel? Invite a student to read Matthew 10:37–38 aloud. Ask the class to follow along, looking for what the Savior said to those who have to choose between following Him and any other thing or person. In your own words, what did the Savior say to those who desire to follow Him? Elder Bednar Speaks on Apostles' Role (2:11)—Elder David A. Bednar of the Quorum of the Twelve Apostles speaks about the role of being an Apostle. This video could be shown from time code 0:00 to 2:11 to help students understand the role of ancient and modern Apostles. It’s True, Isn’t It? Then What Else Matters? (1:06)—Elder Neil L. Andersen of the Quorum of the Twelve Apostles shares a story of a young man who faced opposition for accepting the gospel. This video of Elder Andersen’s April 2007 general conference talk could be shown from time code 0:21 to 1:27 to help students understand why people make sacrifices in order to accept the gospel.